Finding the Higgs boson at CERN involved an exciting chain of events and sharing it with the wider public through the media was also a journey of discovery, Prof. Jon Butterworth told an audience at the IOP's London centre on 2 October. In his lecture, "Smashing physics: inside the world's biggest experiment", Prof. Butterworth explained why a facility the size of CERN was needed to find the Higgs, what the Higgs is and how it was detected, as well as the implications of the results for further research. Prof. Butterworth, who is a leading physicist on the ATLAS experiment at CERN and head of physics and astronomy at University College London, said the two colliding proton beams at CERN were the highest energy particle beams ever used in a laboratory. In order for the high momentum beams to be bent into a circle, its curvature had to be gentle enough for superconducting magnets to be able to control the beams. This meant putting them in a 27 kilometre circular tunnel. High energies are needed in particle physics experiments to study, for example, the constituents of nuclei or protons, but fundamental particles have no size and are not made up of smaller particles, Prof. Butterworth explained. "When you give talks on particle physics you get questions like 'if these particles are not made of anything and there's no structure to them, how do they have any substance at all?'. That's a difficult question that Peter Higgs and François Englert and Robert Brout were asking in the 1960s and it was clear that there was a problem here. The mass of the proton mostly comes from the binding energy of its quarks and gluons, but where does the mass of a quark come from? There's nothing bound inside a quark." 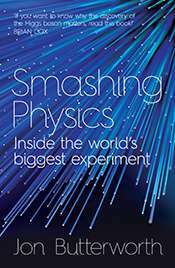 The three physicists had concluded that mass was not something that fundamental particles get because of their internal properties, he said, but something that they get by interacting with a field that fills the whole universe. "It's that that slows them down and makes it harder for them to change direction and speed. "Peter Higgs said that if this field is there, you can make it wobble. The only way you can make it wobble is to hit is so hard that you can cause a quantum excitation in it – that is the Higgs boson and that's really hard to do. You need a lot of energy to make the background field of the universe wobble and that's what the Large Hadron Collider can do." Prof. Butterworth explained that there was a problem in balancing the energies and masses involved in a scattering experiment such as the annihilation of an electron and positron, which results in the production of a massless photon before decay back to an electron and positron. Richard Feynman proposed that photons produced in such experiments should be allowed to have the "wrong" mass and there was a small but non-zero probability that some of them would be detected that have the required mass to make the equations balance. A particle, the z boson, had been detected in this way. He said: "We can go to much higher energies now. When we make the Higgs particle it will decay and one of the ways it can decay is into very high energy photons. You can look for pairs of these photons and you can say 'if they came from the decay of a particle, what would its mass have been?'. You can count pairs of photons and make a histogram and wait." If there was a "bump" in the data it would indicate a new particle, and such a bump was found by the ATLAS experimenters at the LHC at a mass of 125 GeV, where the Higgs boson was expected to be. The same result was found by a slightly different experiment at ATLAS and quite independently by the CMS experiment at CERN. "The probability of this being a random fluctuation is something like 10-13 , which is ridiculously low, and that's just ATLAS. The CMS experiment had the same thing, so you can square that." CERN made the announcement of the discovery on 4 July 2011. Until that time Prof. Butterworth had not been shown definite results from the CMS experiment, though there had been rumours. "You really believe that nature is trying to tell you something fundamentally new when you see someone else's experiment do the same thing, so that was great. We were absolutely elated because we were prepared to put our money on the table and say we had found something completely new." Long before the announcement, there had been discussions at CERN about how to handle the media. Some had wanted to wait until the experiment was complete and to present the results as a fait accompli. "There were others who were saying 'it's going to be a long story anyway – you should invite people in from the beginning and show them how it works. We don't know what's going to happen, so why not share that excitement as well?' Two big players in that were James Gillies, head of communications at CERN, and Brian Cox. "Brian was already known to the BBC, though not the megastar he is now in terms of science communication. He persuaded Radio 4 to go out there for a whole day and all their live stuff was done from CERN on the day of the start-up. This terrified everyone at CERN – the last thing you want when you're doing the most difficult experiment you've ever done is a load of journalists looking over your shoulder, but it was fantastic, it really worked. "There was a decision to do this openly and be engaged and it was on the whole a really positive experience but it's not without its risks and it wasn't all good fun." The difficulties included a last-minute call to appear on Al-Jazeera English to debate with a scientist who argued that the experiment could destroy the world. "I went on the programme in the end. You lose control at some level but you have to trust the media and Al Jazeera reach a very different audience from the BBC. There were some genuine concerns about what we were doing and they got really positive feedback from that programme. "It was another lesson that it's better to engage than not, and we particularly needed that because nine days after being so clever-clogs in the media we blew the thing up and broke it. We had PhD students starting at that time and I had to say 'I'm sorry but you're going to have to wait another year for the data'. The key thing was that having been all over the media one week, we didn't all suddenly vanish when it broke. We carried on explaining what was going on – you take a risk but it usually pays off." Work on the results of the experiments continues. "We don't yet know whether the Higgs is what gives mass to electrons or quarks – we've got evidence for that but not absolutely nailed down. We'll come back and do more of that next year but we do know that it interacts with the z and w bosons." In a question and answer session, Prof. Butterworth said that further work would include "measuring the Higgs to death" when the LHC restarts. "The Standard Model is internally consistent and complete and there's no other missing particle in there, but there are other questions. The Standard Model doesn't include gravity, or dark matter, or dark energy, or the asymmetry between matter and antimatter. Within the Standard Model there is no 'what next?' but clearly in nature there is more." Speaking of the publicity surrounding the experiments, he said: "I think this was a time when science and physics really did get out there and make more of a cultural impact. More people shared the joy of the discovery than I think we could have dreamed possible and that's been a real privilege and it also made me write a book about it."